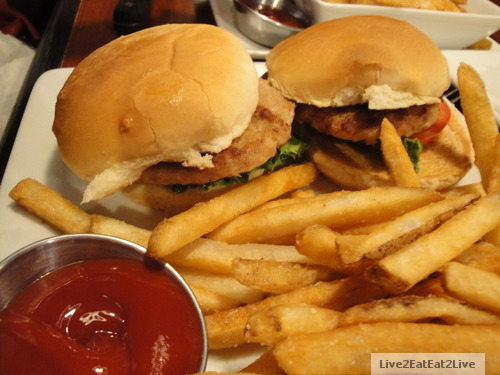 I had their mini combo turkey burger which included two mini turkey burger sliders, fries, and unlimited trips to the salad bar. 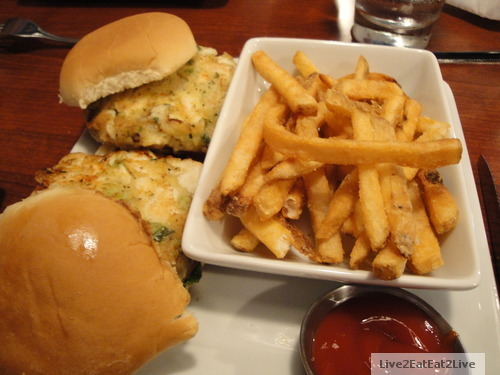 The Cat ordered their mini crab cake burgers which included two mini crab cake burgers, fries, and unlimited trips to the salad bar. 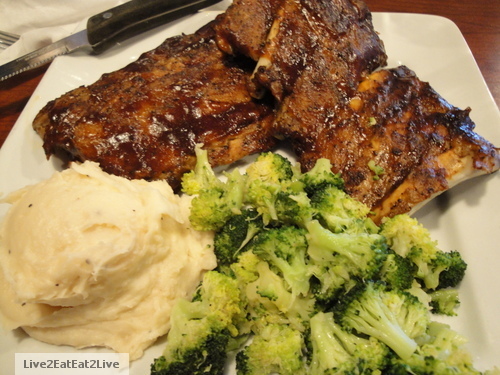 The Qi Master had the baby back ribs with salad bar. 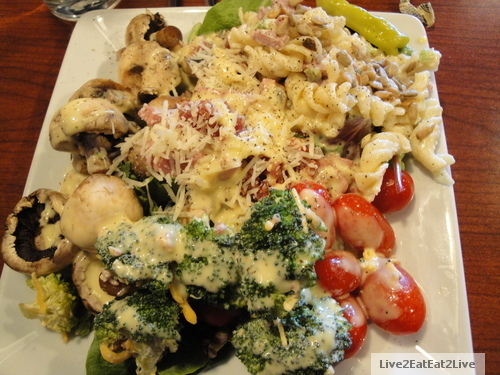 Mistress Qi ordered the salad bar. At the end, we were all too full to order dessert. Instead, we finished with fruit from the salad bar. 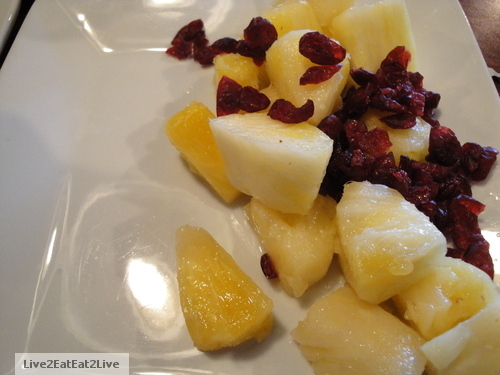 I had pineapple and dried cranberries. All in all, a good weekend. 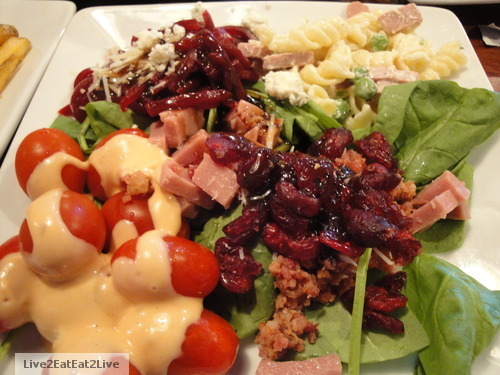 Eating, talking and laughing with friends; living to eat and eating to live. We took home food from both eating events and ate the leftovers as a part of tonight’s dinner (too much information?). This weekend, we ate out twice. On Saturday, we had dinner with one of The Cat’s earliest clients who The Cat now considers a friend. Mrs. N wanted to show us something in Waikiki and took us to dinner afterwards. 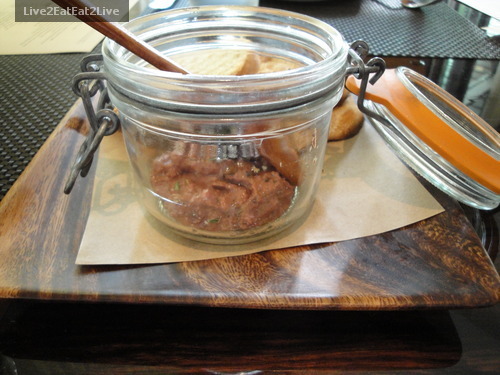 After taking our drink orders, our server presented us with the restaurant’s complimentary chicken liver pate with toasted ciabatta. Do you know where we are yet? Here’s another clue. The server then brought complimentary popovers. 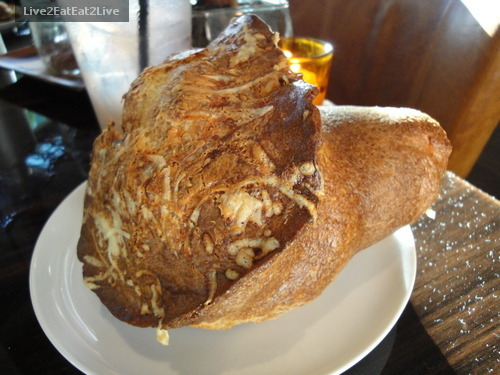 The popovers contain gruyere cheese so were tasty enough to eat without the accompanying butter or sea salt. 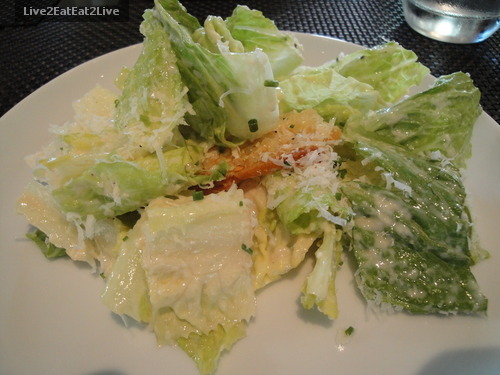 If you guessed here: http://www.bltsteak.com/, you would be correct. Mrs. N has eaten here several times already. This was the first for both of us. 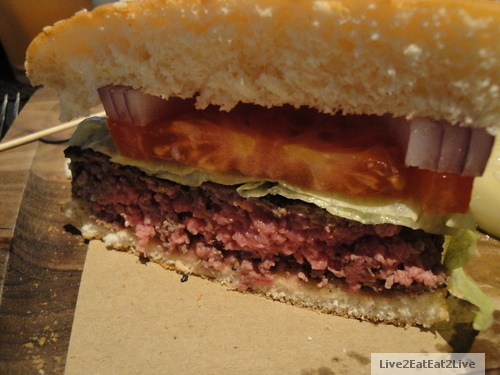 I ordered their certified Black Angus hamburger with fries (medium rare). 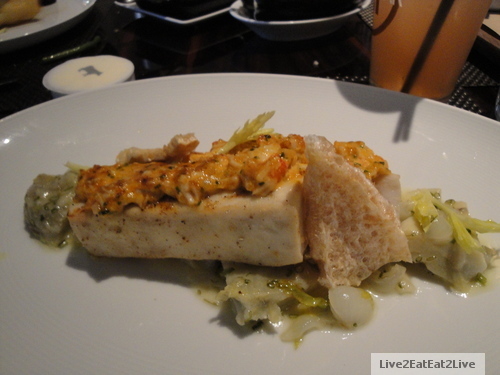 The Cat really liked her order, she especially liked the crab gratinee and artichokes. She was a bit neutral about the crackling. She had nothing against the crackling, she just wasn’t sure it coordinated with the fish. 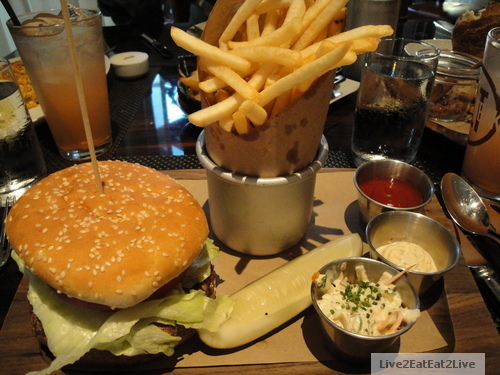 My hamburger was excellent. The meat melted in my mouth. 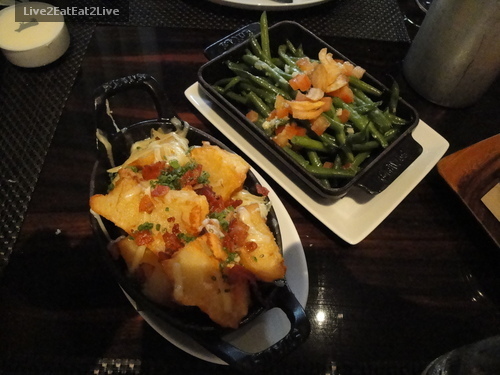 We shared sides of baked, fried, and gratinee potatoes with Gruyere cheese and bacon, and poached green beans. The servers forgot our order of double cut bacon. More reason to return. 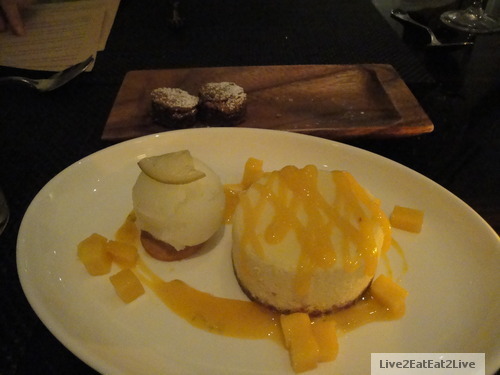 For dessert, we shared one of their blackboard special desserts, “golden globe mango cheesecake, margarita sorbet, and mango lime sauce.” I’m not sure if they meant “golden globe” mangos or “golden glow” mangos. In any case, it was delicious. The restaurant also gave us complimentary chocolate tidbits. They tasted like a warm chocolate brownie. The Cat ate hers before I could take a picture. Thank you Mrs. N for your company and generosity. Here’s what the menu looks like: http://www.bltsteak.com/PDF-Honolulu/dinner-menu.pdf. I’ve wanted to pick up one for a while. Some tasks in the kitchen require a large whack. 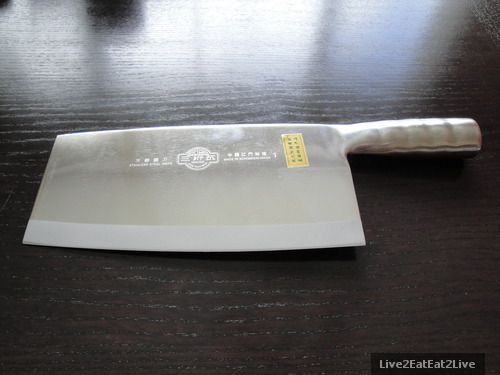 The cleaver type knives in the kitchen stores at the malls were priced out of our range. In addition, I wanted a knife I didn’t have to worry too much about. A few doors up from the Chinese bakery (see previous post), there is a store that sells anything to equip a Chinese kitchen (woks, knives, dishes, etc.). The knife I bought was one of the smaller chopping knives that they had (the blade is approximately four inches tall by eight inches long). I originally was looking at a similar knife for $9.00. The shopkeeper said the one I purchased was better quality for $15.00. The mall stores were selling their cleavers for at least quadruple the amount. This knife will take some time to get used to to (I’m more used to to the Japanese made thin blades). Here’s a picture of the box cover, if you’re interested. 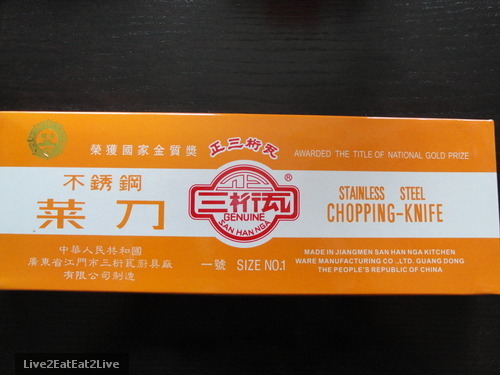 This knife kind of reminds me of the knife Aunt P handed to me to clean chicken feet (its flashback time). Must be careful of the fingers.